Sunday wins cap off massive weekend for title favourites. 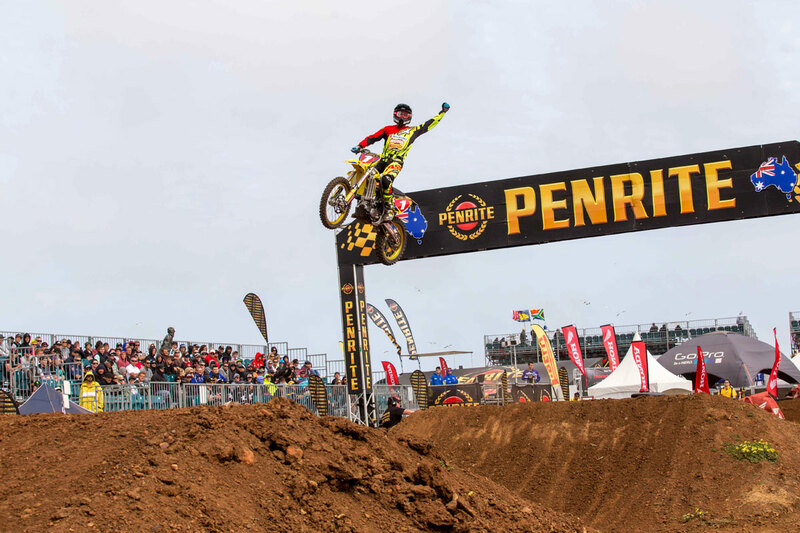 Current Penrite Australian Supercross Champion Matt Moss has maintained his perfect season during Phillip Island’s fourth round today, overcoming a disastrous double DNF in the heat races to win his fourth main event of the season. The Team Motul Suzuki rider suffered a rare chain derailment in the first heat before it broke in the second, but he bounced back in the 20-lap main event to take victory by 4.554 seconds. Moss won ahead of former champion Jay Marmont (Penrite Honda), who continued his upswing of form at the Island with a second podium, and Kirk Gibbs (KTM Motocross Racing Team) was comfortably in third. Saturday podium placer Lawson Bopping (Team Motul Suzuki) had to settle for fourth today, one position ahead of Adam Monea (NPS Monster Energy Kawasaki), and the pair are now tied for second in the series – 22 points behind Moss. Sixth place was the result for Jesse Dobson (KTM Motocross Racing Team) the second day in a row, as Kade Mosig (DPH Motorsport Yamaha), American Keith Tucker (Penrite Honda), Josh Cachia (Husqvarna Motocross Racing Team) and privateer James Booth-Elliott (Suzuki) completed the top 10. Second NPS Monster Energy Kawasaki pilot Jake Moss had another disastrous day, ruled out of the race after a first-turn crash that also took involved Cachia, Mosig and more. In the SX2 division American Gavin Faith (Penrite Honda) extended his lead with a third-straight win, by 8.889s over Australian rising stars Taylor Potter (Boardstix Motorsport Honda) and Hayden Mellross (Raceline Suzuki) in a popular podium. 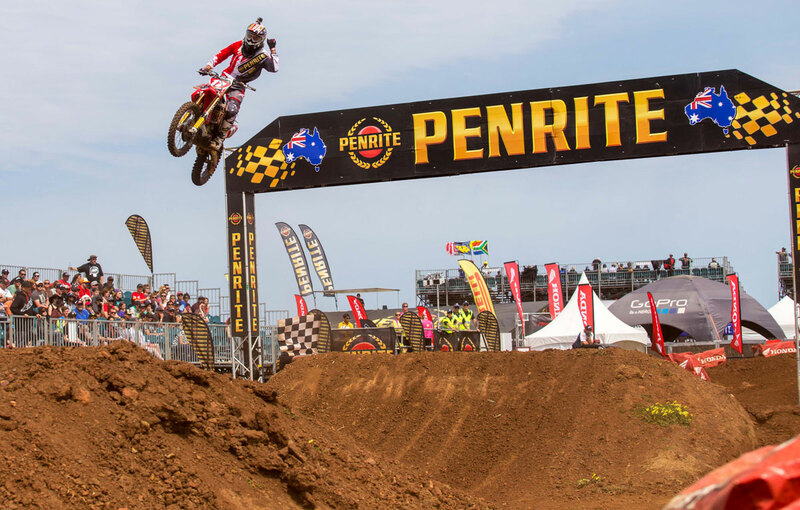 Wilson MX Honda guest Kyle Peters was off the podium on Saturday, but still rode good enough for fourth, and retains second in the title chase 18 in arrears of Faith. Fifth was Luke Arbon (SD3 Husqvarna), edging out Saturday podium scorer Kale Makeham (Tunetech Racing KTM). The SXD category was today won by Jack Simpson (Davey Motorsports KTM) by virtue of his final race victory, edging out races one and two winner Dylan Wills (KTM Newcastle) and Trent Wheatley (Penrite Honda) on the podium. Simpson now leads the title over Wills, while previous red plate holder Brock McLeary (KTM Newcastle) has been demoted to third after finishing fifth today. The Junior Lites class was again won by Jordan Hill (Yamaha Junior Racing) with 2-1-1 results in round four, followed by race one winner Lachlan Holroyd (Yamaha) and Travis Silk (KTM) – the trio also occupying the top three in the standings. The series will now heat to the Brisbane Entertainment Centre on 8 November for the final stop of the five-round calendar.